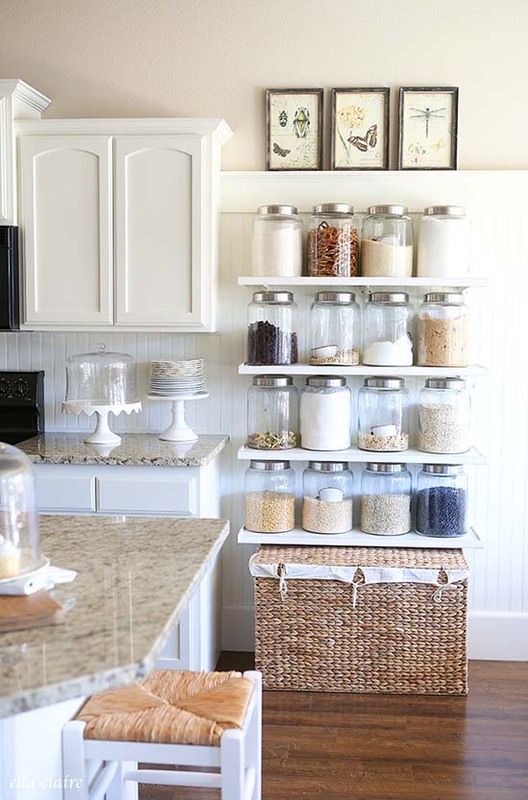 If you love farmhouse decor as much as I do, than you probably know that getting more storage space and organizing stuff at home is not so easy. 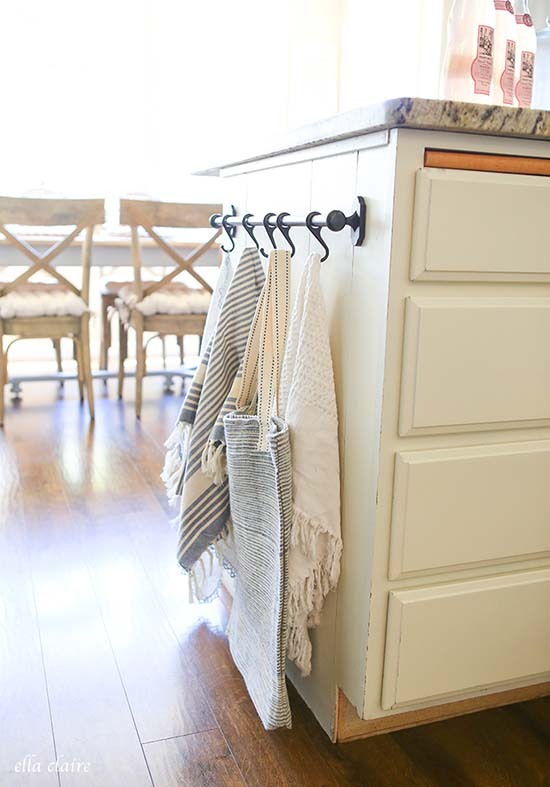 I have some gorgeous organization ideas that can maybe ease your way around the kitchen. Flip through and see if you will get a practical idea that you can take, twist or tailor. 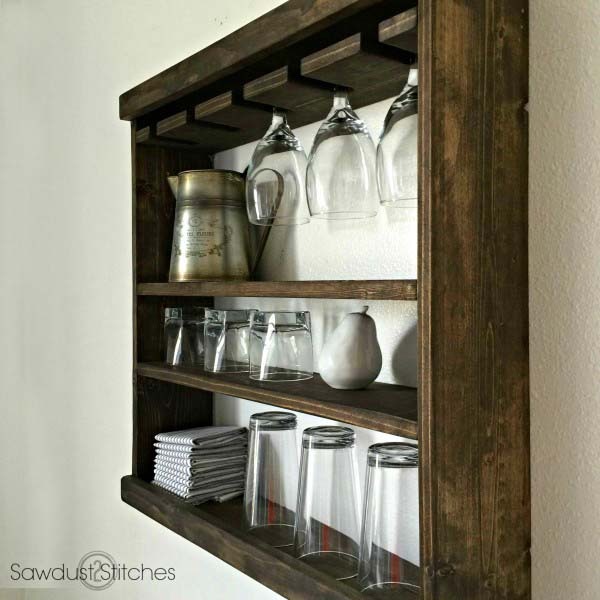 This would make a great project for someone who doesn’t have room for a full-size dining room hutch, or simply wants more space for drink ware. Ever thought of lining up your cups and glasses on a simple wooden rack? It can save so much space! It is easy to do and won’t take much time or resources to be done. 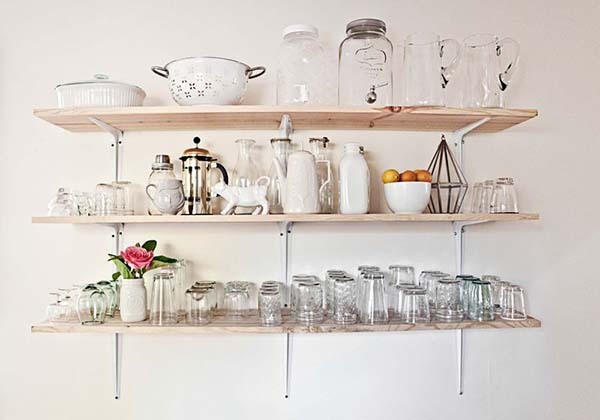 Follow the steps in the tutorial to create similar or the same glass rack. You can change the type of wood and color and also the size and shape. Be creative and create whatever suits you. If you need more storage space than first thing is to mount some shelves. These are made of natural wood and are easy to DIY. 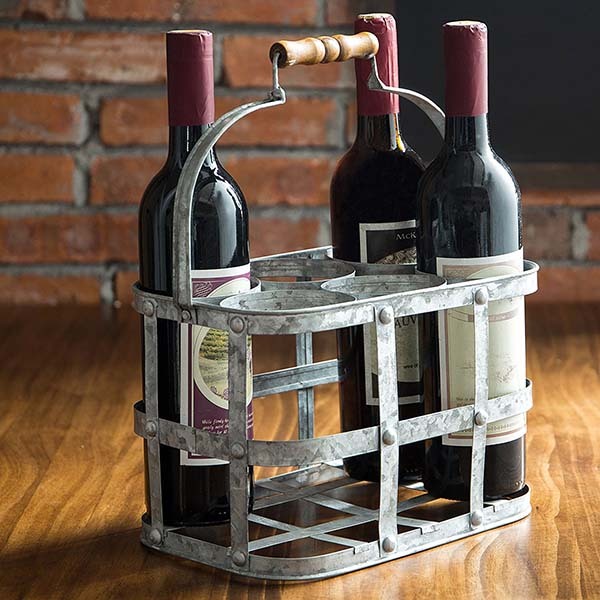 If you want to carry or store your wine bottles this great carrier is all you’ll ever want! 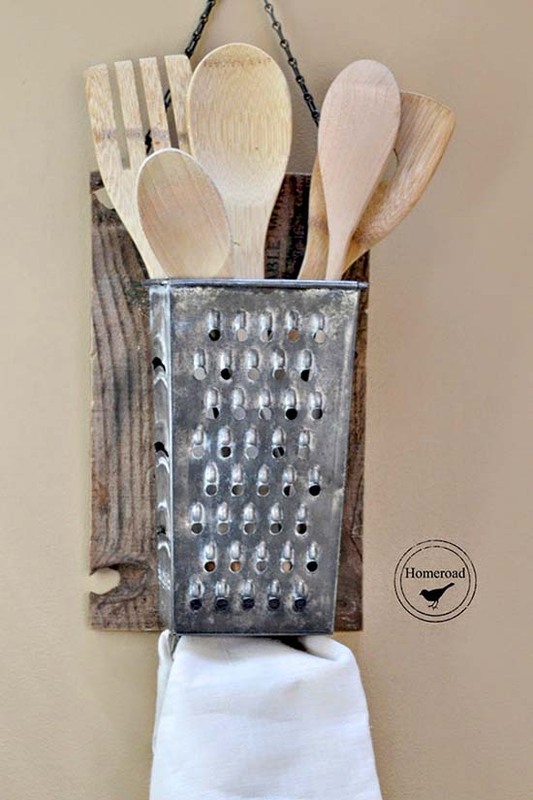 This just gives me another reason not to throw out old graters – they can be used to store spoons and utensils. They also look wonderful in a country kitchen. Don’t be in a hurry to toss out old graters! 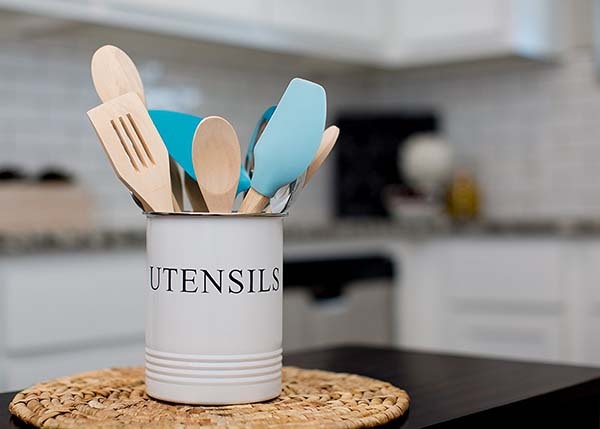 You can turn them into a hanger or a container for the utensils in your kitchen. By keeping everything in sight, it will be much easier to locate it. You need a place to hang your towels, right? So why not mount a side hanger to the countertop? 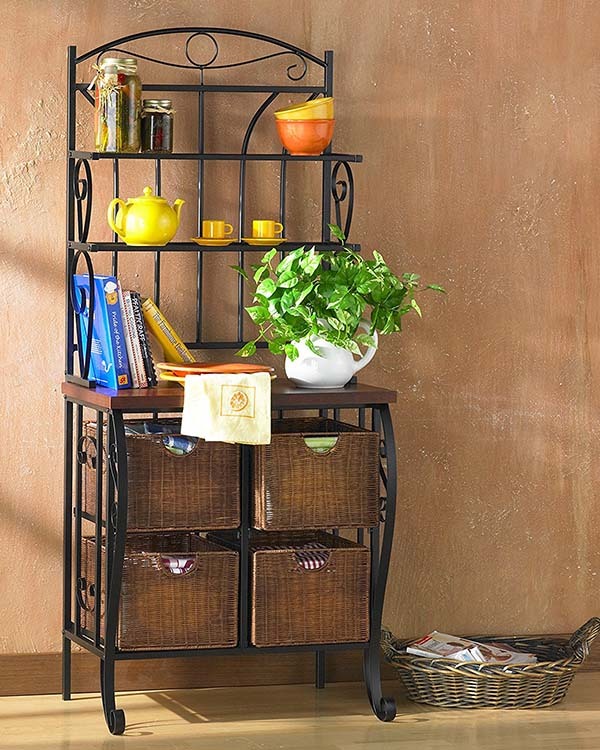 Everybody loves this rack – here is a customer review: Super easy to put together and looks great in my Tuscan-inspired kitchen. Our monstrous microwave was a bit too tall so we were able to leave off the middle shelf. Very convenient. I did a lot of research on racks before settling on this one and I am so glad I did it. We have a very narrow galley kitchen and storage is very minimal. The extra storage drawers at the bottom of this rack are great for little kitchen gadgets that otherwise get lost in cabinets. 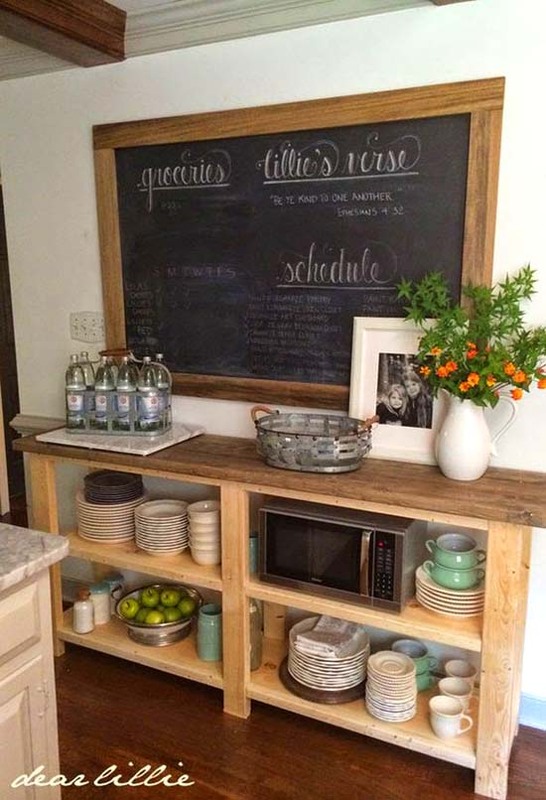 I love that she took a preexisting Better Homes & Gardens bookshelf and turned it into extra kitchen/pantry storage. Who said bookshelves were only good for books? Storage and organization are sometimes easier to do than we can imagine. 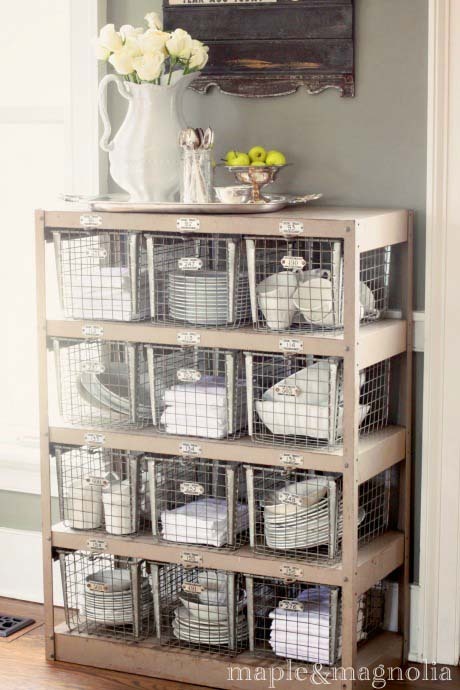 If you don’t have enough cabinets and drawers in your home, simply install a tall rack. 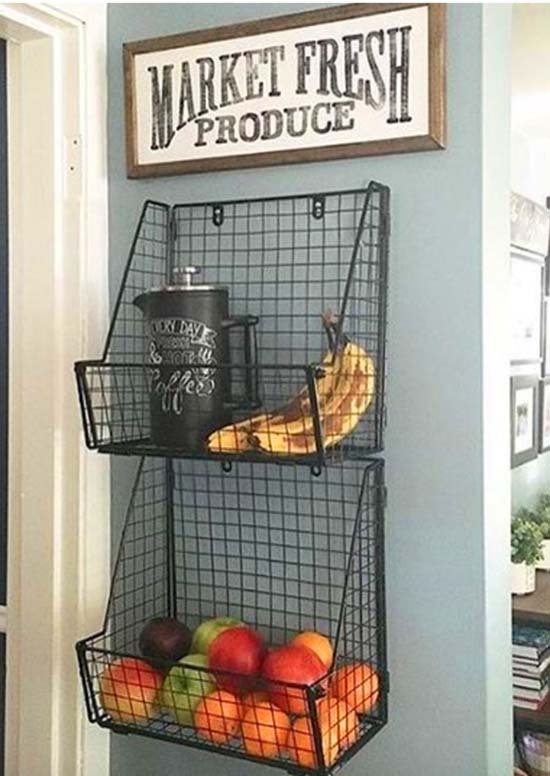 Get some wire mesh baskets, hang them on the wall and put your favorite farmhouse sign above. That’s all you need to do to replicate this design. 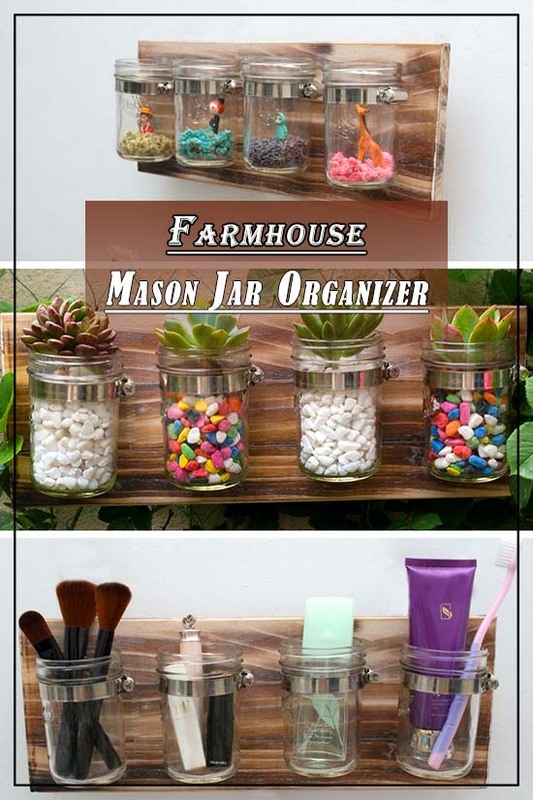 You can use some mason jars to organize a lot of things, not only in the kitchen, but also in a home office or use them for makeup. So, this used to be gym lockers. Hard to believe, right? Something like this could definitely work in other areas of the house. Okay, ladies and gentlemen, I have something pretty unusual here. Do you have any furniture with no particular purpose around? This rack used to be a gym locker! 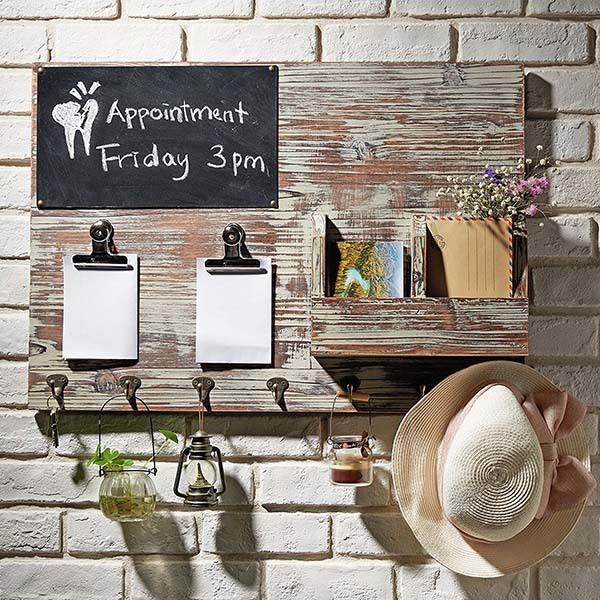 Chalk board decoration is great addition to any farmhouse interior design. You can write some beautiful home quotes and sayings or you can just use it to write down a schedule, groceries list, etc. It seems like such a simple little change, but using woven baskets like this can really make a difference in the kitchen or pantry. Pantries often become the garbage disposal spots for many families. Why so? Well, lack of time and possibly lack of energy to go into all that old mess and fix it. 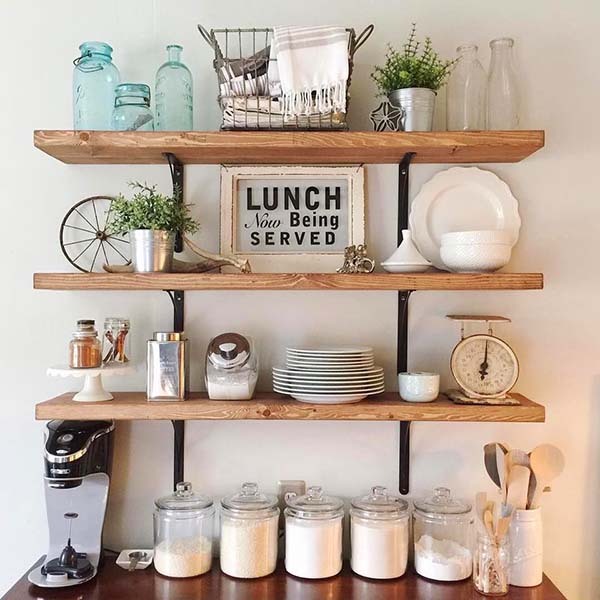 These shelves are also a display for the mason jars. Wicker trunk at the bottom makes it the perfect farmhouse storage idea. 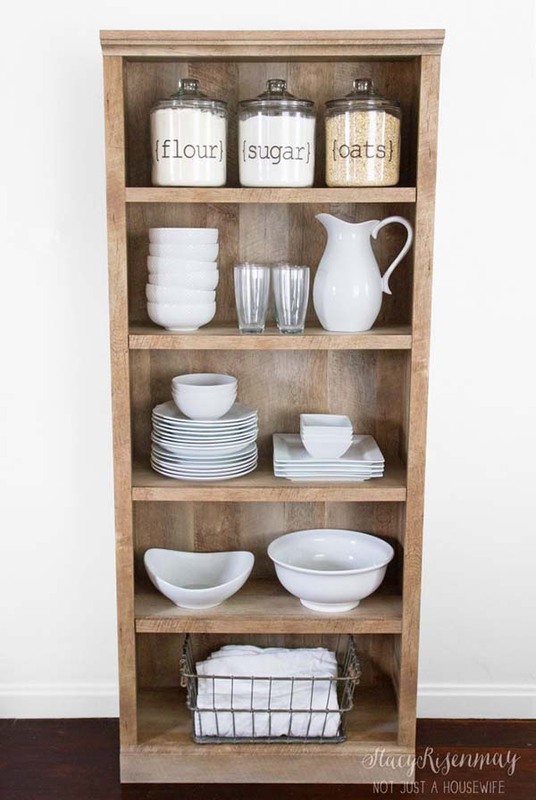 Farmhouse style decorative wood and metal kitchen storage rack with natural distressed whitewash finish that can be used for a lot of things. From memo clips to recipes and mail. These kitchen shelves have so much charm to them. They look like they would be incredibly easy to DIY and a great alternative to floating shelves. How adorable is this! If you wish to have a spot that is just as beautiful and bright, simply buy a white rack – install it and start decorating. Jars, plates, flowers and candles – they are all going up there. You can even add books and still keep it a tastefully decorated place. This ladder shelf is hanging on a rope to create real farmhouse atmosphere where everything is natural and eco-friendly. 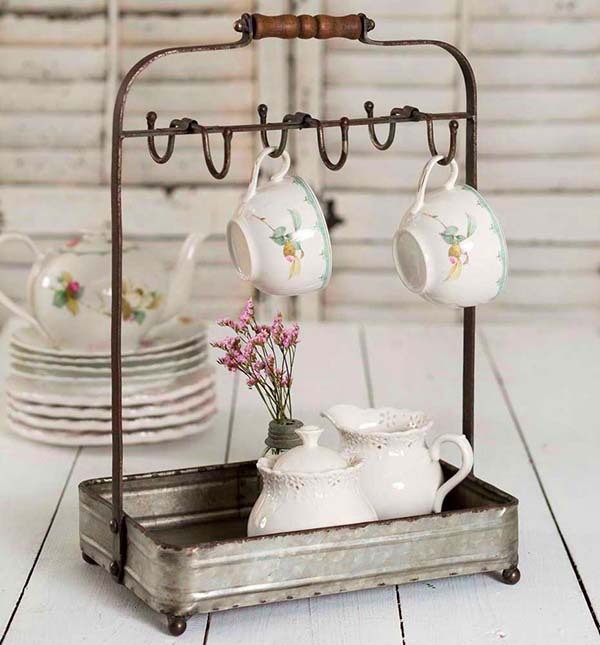 This terrific display can keeps your coffee and tea items, sugar and cream and honey all organized in one location with hanging mugs! Built-ins are a great way to create more storage without taking up additional space. Built-in furniture is not going away from the stores anytime soon. So many people live in a limited space that organizing becomes a prerequisite for mental health. Built-in shelves on the wall are a positive addition to the house. Not only do they look good, they keep everything else look better! 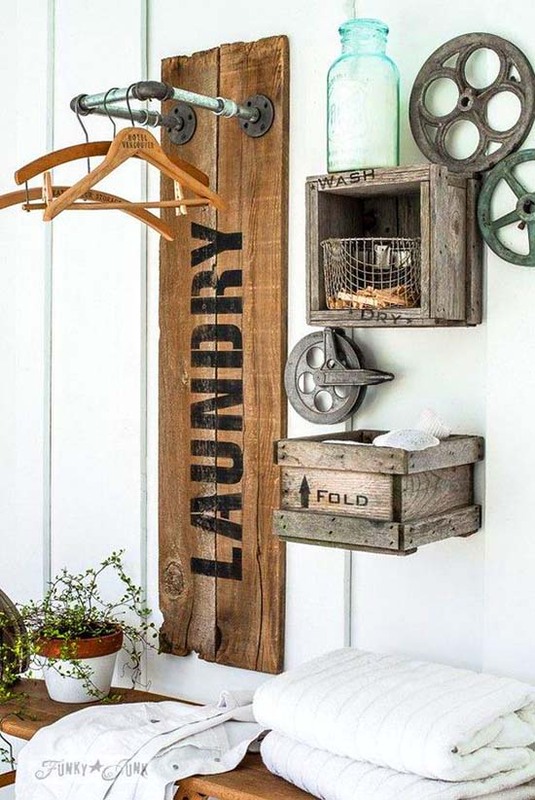 Creating a laundry specific area with farmhouse decor is easy. 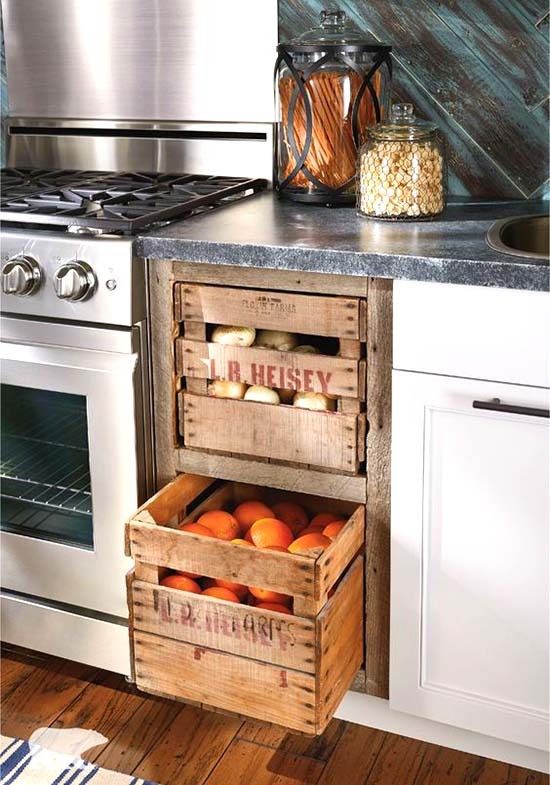 Add a stencil and some old wooden crates and arrange them as per your taste. 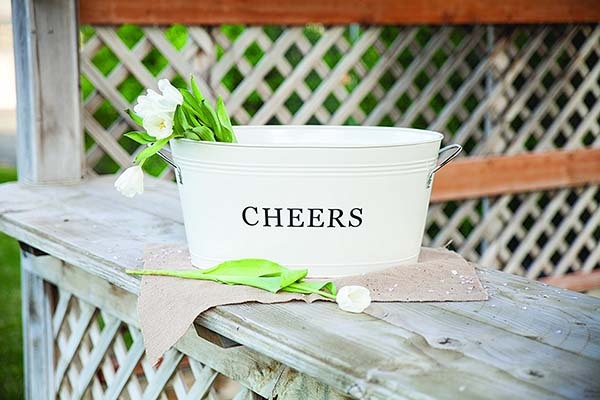 If you like to hold your beer bottles or flowers in a farmhouse decor drink tub, this is a great item. 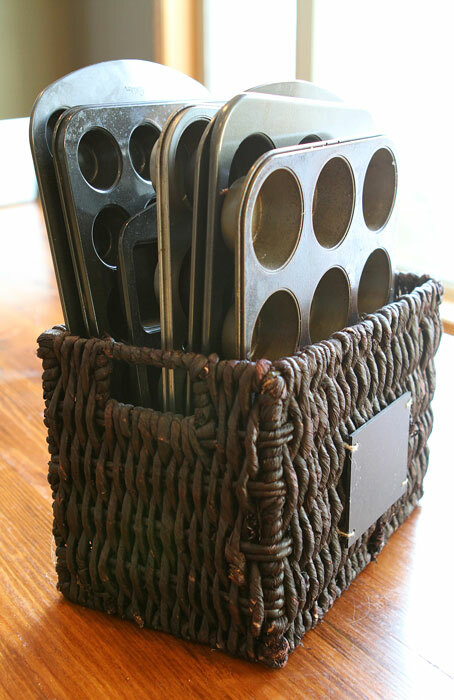 Use old crates and crocks to store your utensils. Doesn’t that look charming? 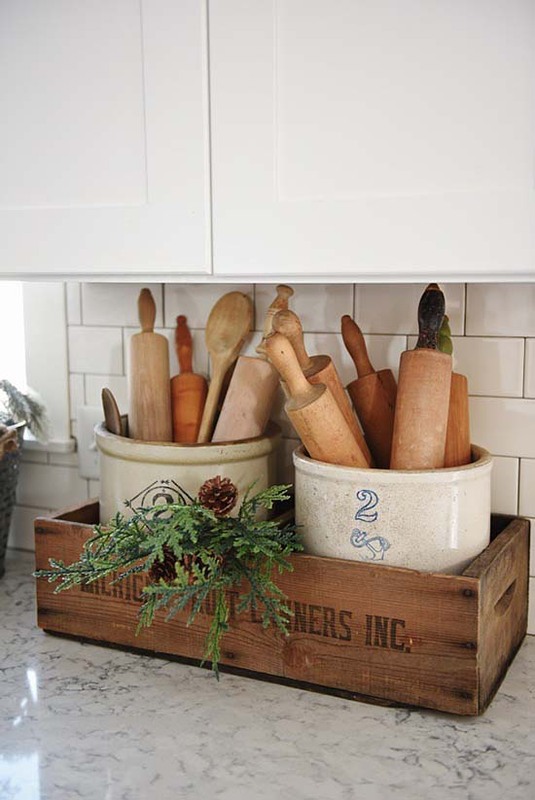 Utensils can be stored in old crates. If you are not favoring the crates that much, then simply add a charming tray instead. Like the ones that are used to carry the coffee and croissants in bed in the morning. Yapp, those ones. They are perfect for our purpose! You can even have some fun and paint it! These wooden crates are used as cabinets, but you shouldn’t load them with so many fruits as they will become too have to be pulled out. Anyway, it’s a great food storage idea! 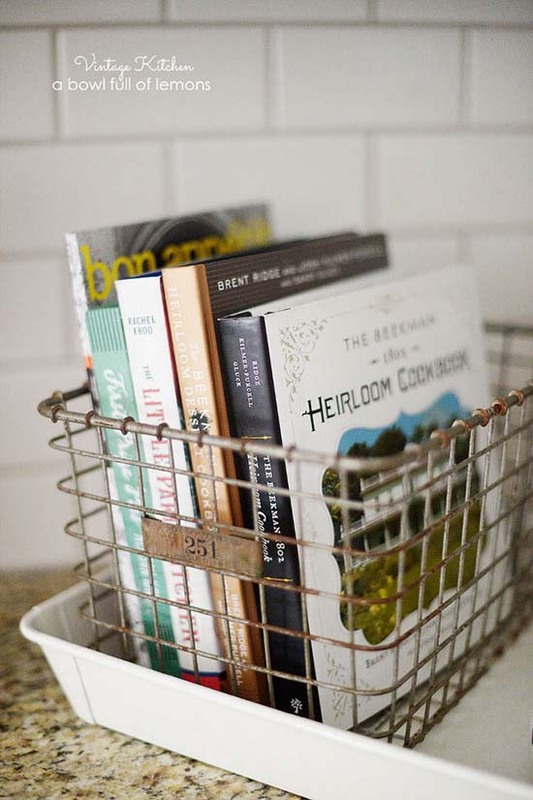 This is a nifty way of storing cookbooks, recipes and magazines. Magazines, cookbooks, notebooks, drawing boards, and all sources of inspiration, can easily be organized like this. 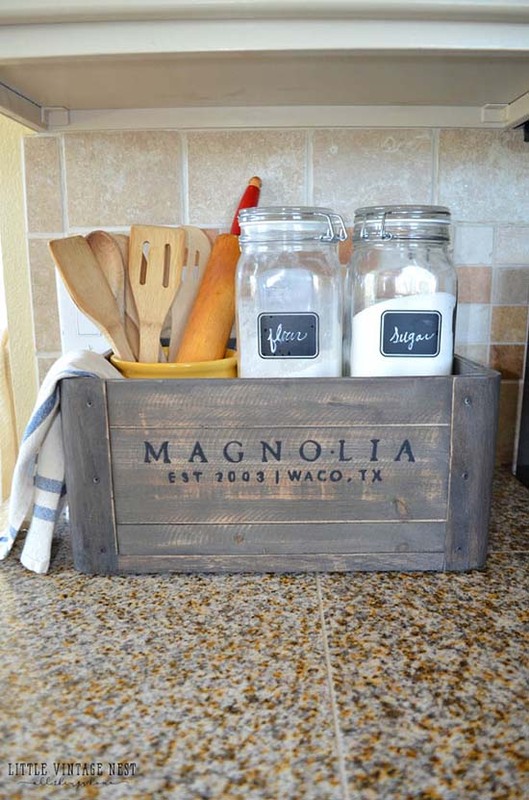 What a great way to add a rustic touch to the kitchen. Last but not least, follow my lead in this kitchen and take a look. 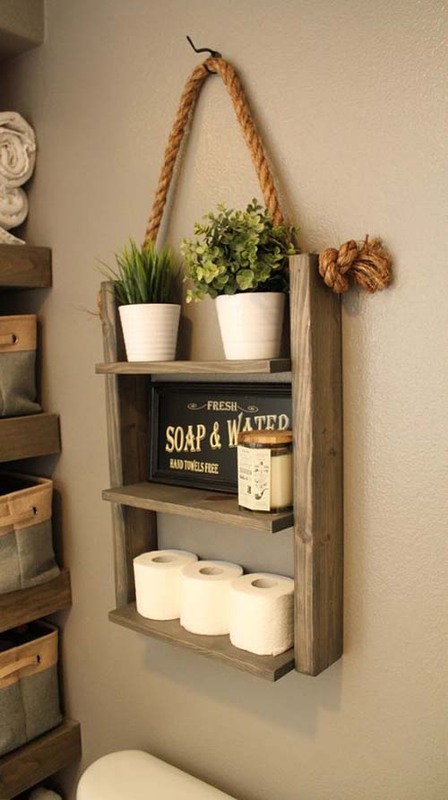 This is an example of creating a rustic look in a minute. 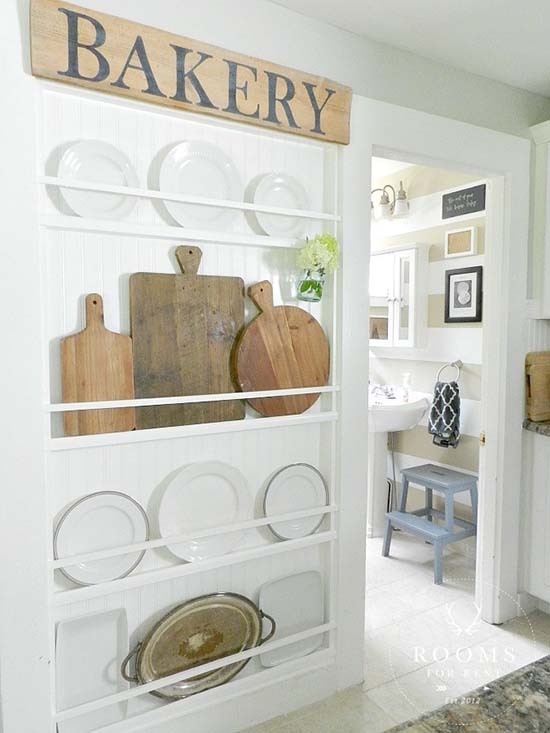 If you liked these farmhouse kitchen storage ideas, please SHARE or PIN for later.